Always consult your physician or midwife before you take any of these suggestions. Towards the end of our pregnancies we all make sure that we have our baby items ready, have taken our childbirth classes and newborn care class, done the hospital tour, etc. You may even be seeing a chiropractor or acupuncturist to help your body get ready for the big day. (Which I highly recommend!) But did you know that there are actually some products that you can have at home that can help better prepare your body for labor and birth? Well there are! Get your body ready for your baby’s big day with these products. I’m sure you’ve all heard that raspberry leaf tea is good for women to drink during their pregnancy. But do you know why? Well studies have shown that it can actually help make labor faster with fewer complications and interventions during birth. Pretty amazing! I will say that I have tested several different brands of raspberry leaf tea and I highly recommend Earth Mama’s Organic Raspberry Leaf Tea. I really enjoyed the taste of their tea (some other brands I’ve tried aren’t as tasty) and I love that their product is USDA Certified 100% Organic. It can potentially help reduce morning sickness. It improves the strength of the amniotic sac. This means that your bag of waters is less likely to break prematurely, which is a good thing. It improves the effectiveness of your contractions. It reduces pain during labor and after birth. Because raspberry leaf tea helps strengthen and tone your uterus and pelvic floor it can cause your labor to be shorter and less painful. It’s beneficial to VBAC moms. Women who have previously had C-sections have a higher chance of uterine rupture than women who haven’t. By regularly drinking raspberry leaf tea, women attempting a VBAC can have a stronger uterus, which can help reduce their chances of uterine rupture and help achieve their goal of a VBAC (vaginal birth after cesarean). It helps balance postpartum hormones. It has a high mineral count so it helps bring in breast milk. It encourages optimal fetal positioning. How does it do this? Well, when you sit on a birthing ball you aren’t able to slouch so you have to sit with good, proper posture. Keeping your core engaged and having good posture helps keep your body in alignment and that encourages your baby to be in the best position for labor and birth. When your baby is in a good position, it helps your labor progress faster and allows you to have a less painful and more enjoyable birth! It opens your pelvis and hips to encourage your baby to drop lower into your pelvis. When your baby drops lower in your pelvis your baby’s head applies pressure on your cervix which can encourage dilation and effacement. By doing figure 8’s and hip circles while sitting on the birth ball, it can encourage labor to begin on its own. Of course this is only assuming that the woman is near her due date and both the woman’s body and baby are ready. This will not cause you to go into preterm labor. Another great product to use during your third trimester to prepare your body for labor and birth is the peanut ball. Just like a birthing ball, a peanut ball can help get your baby in a better position for labor, which can then help you go into labor sooner and have a faster birth. Sitting on a peanut ball requires you to get into a deeper squat than a birth ball does, which then helps open our pelvis even more and can apply more direct pressure on your cervix to promote dilation and effacement. For more information about peanut balls, read this. One of the most common concerns of pregnant women is the fear of tearing during childbirth. I was one of those women so I understand. I wanted to do whatever I could to help reduce my chances of tearing. 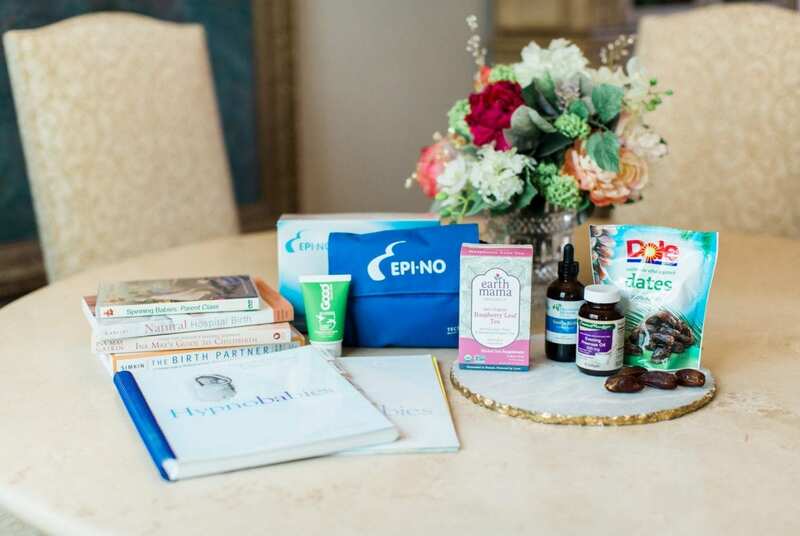 Several of my doula clients have used Epi-nos during their pregnancies to prep their vaginas and perineums for labor and “the ring of fire.” And you know what, most of them didn’t tear at all! The few that did tear only had very minor lacerations that they didn’t even require stitches. This was enough proof for me to use the Epi-no during my pregnancy and I can’t recommend it enough. It helped train my body to stretch which ultimately helped me to not tear when I gave birth to my 8 pound 6 ounce son. Two thumbs up! Performing perineal massage can be difficult for women to do on themselves when they are further along in their pregnancies. This is why it is encouraged that the partner help with this task. When performing perineal massage, use a good lubricant (like this one) to help make this uncomfortable stretching of the perineal tissues more comfortable for her. She will thank you for it! As a birth doula, I have been to some amazing births, but I have to say some of the most incredible births that I have ever been to have been Hypnobabies births. Hypnobabies is a complete six-week childbirth education course that is offered in a classroom setting by certified instructors, or through a self-study course. They cover all about staying healthy during pregnancy, changes in the body during pregnancy and labor, choices about medical procedures and medications, creating a birth plan, early days with baby, and more. But what sets Hypnobabies apart from any other childbirth method is how it mentally prepares mothers for birth. Women are more in control, more relaxed and ultimately have much more enjoyable experiences. I’ve been a witness to it and it really is incredible. I must say, taking the course alone will not help you completely. Women who really dove in head first, practiced daily, listened to their tracks daily and committed to the Hypnobabies program were much more successful at having a “pain-free” Hypnobabies birth. The births that I have been to literally look like labors and births that all women hope and dream of. I highly suggest that you look into it! Dates contain certain stimulants, which assist in the strengthening of the muscles of the womb leading to easier delivery. A study from Journal of Obstetrics and Gynecology, 2011 suggests that dates can help ease delivery since they help cervical dilation, and also reduce the duration of labor, as well as the need for induction and augmentation. The studies were on women who ate 6 dates per day in the last 4 weeks of pregnancy. Dates contain Oxytocin. All pre-birth preparations in the body take place thanks to this hormone, and it also initiates the secretion of mother’s milk. Since the sugars in dates are fructose, not glucose, they will provide energy to the weakened body to quickly revitalize it. This is especially helpful to a woman in labor. A pregnant woman’s daily vitamin A requirement will increase to 800 ug, which dates are very rich in (beta-carotene). Dates contain Folate, which helps in the prevention of dangerous birth defects. After delivery dates are given to prevent postpartum bleeding and evict the placenta. Not only that, the date is considered to be the best food for breastfeeding mothers because it contains elements that enrich the milk with nutrients that make a healthy and disease resistant baby, all while also helping to alleviate depression! Who can say no to that?! Over 90% of women who tried the Original Gentle Birth Formula recommend it to family and friends! I only heard great things about it so I decided to use it myself during my pregnancy. I thought, what could it hurt? And I’m so glad that I did. (Obviously, discuss this with your doctor or midwife before taking it.) If your healthcare provider gives you the green light to use Gentle Birth, you should begin taking it 5 weeks before your estimated due date. Week 1: Take 1/4 teaspoon before morning and evening meals. Week 2: Take 1/4 teaspoon 3 times daily before meals. Maintain this dosage until delivery. If you are approaching your due date or have passed it, one option that you may have considered taking is evening primrose oil. Evening primrose oil is an herbal oil that’s derived from primrose plant seeds. Many women have used evening primrose oil for decades to help with cervical dilation for preparing their bodies for labor. While evening primrose oil doesn’t induce labor per se, when it is taken orally or vaginally, it is believed to act as a prostaglandin that softens and ripens the cervix. As the cervix ripens, contractions are triggered which may lead to labor, or Braxton-Hicks contractions. Additionally, the softening of the cervix may help make labor and delivery quicker and easier. I know of several women who claim that evening primrose oil helped their bodies go into labor. Some evidence suggests that the mild prostaglandin effect of evening primrose oil will only trigger labor in women who are ready to deliver and cannot trigger premature labor. However, many OB doctors feel strongly there is a huge risk of premature labor and shouldn’t be encouraged. This is why you should discuss this with your care provider beforhand. Not only do you need to prepare your body physically for labor and birth, but you need to prepare mentally as well. I always say, birth happens between your ears not between your legs. What I mean is labor and birth are so much more mental than physical. If you prepare your mind for what’s to come, you are able to achieve more than you ever thought you could. If you educate yourself, listen to positive birth stories, and surround yourself with positive birth affirmations your mind will be ready and excited for your big birthing day! Are there any other products that you recommend to help women prepare their bodies and minds for labor and birth?